The congresswoman first contacted by a Bay Area professor about accusations that Supreme Court nominee Brett Kavanaugh sexually assaulted her is calling her constituent's decision to go public a tremendous act of courage. Democratic Rep. Anna Eshoo of Palo Alto said on KQED's Forum she met at length with Christine Blasey Ford privately in July. Eshoo spoke of Ford's decision to go public with the accusations against Kavanaugh. 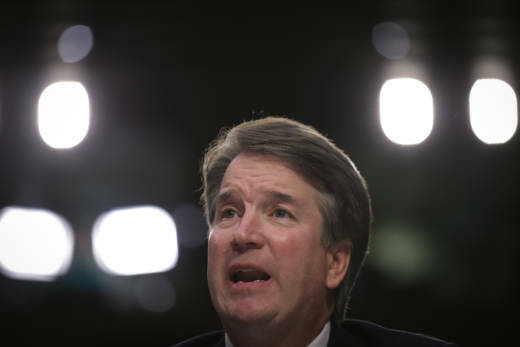 Ford has alleged that Kavanaugh assaulted her at a party in the early 1980s when they were both students in high school. Kavanaugh, who was at the White House on Monday, vehemently denied Ford's account. Senate Judiciary Committee Democrats on Monday, led by California Sen. Dianne Feinstein, called for Kavanaugh's confirmation vote scheduled for this week to be delayed. The following interview between Eshoo and Forum host Michael Krasny has been edited for clarity. Michael Krasny: When you received this letter, and she is in your district, what was your first response? And you were told by her that she wanted it to be confidential and she certainly wanted to be anonymous, right? Rep. Anna Eshoo: Well, Dr. Ford is my constituent. She contacted my office. We certainly followed up with her, and I met with her for an extended period of time in July. I thought that it was important to listen very well to her story, which she wanted to share with me, and she did. And it was also important for me to emphasize to her that she tell me what she wished me to do with it, or that she was simply confiding in me and wanted to know the story of what had taken place earlier in her life. Privacy is so essential for individuals that have undergone or been subjected to any kind of sexual assault. And so she was the one that made the decision that she wanted this to move in a pathway that she thought would be helpful. And so I contacted Sen. Feinstein because ... Dr. Ford is her constituent as well. And Sen. Feinstein is also, as you know, the ranking member of the Senate Judiciary Committee. And so she wrote a letter. We made sure that it was hand delivered to Sen. Feinstein's office, and then it was in Sen. Feinstein's hands. Krasny: At this point we're talking about allegations that happened a long time ago. Let me ask you just bluntly, did you find her completely credible? Eshoo: I did. I did. She told her story very carefully. It was more than obvious to me that this had really had an impact on her life, and that's why I think that it is a tremendous act of courage that she would decide to go public with this. She understood all along that there would be consequences if she did go public. It would upend her privacy, the privacy of her family, and she was obviously willing to risk these factors to present the truth. Krasny: Part of the Republican narrative is that she is a Democrat and has given money to Democratic candidates, perhaps even to you or Sen. Feinstein, and I don't know, but at least that's on the record, and I wonder what you say to that kind of narrative, that this is partisan or that it has partisan qualities to it. Eshoo: Well, I've never met this constituent before. But what I would say about that is that sexual assault ... it's not Republican and it's not Democrat. This is so offensive. It damages the individual emotionally. There's tremendous fear that surrounds going public with it. We certainly kept all privacy and confidentiality around the case, but she was the one that made the choice. And she spoke about her, I know publicly, that her role as citizen in weighing the risks of coming out publicly were very important to her because this is one of the most consequential decisions that is made in our country — an appointment to the Supreme Court. I have no doubt that sexual assault victims carry a lifetime of damage I would say, emotionally. But this is also a lifetime appointment to the Supreme Court. So this is not anything that's partisan to me. But as you mention it, it is a legitimate fear for someone crossing from privacy into the public square to bring forward what she suffered. KQED's Don Clyde and Ted Goldberg and NPR contributed to this report.